Of course it is, and again, one person can make change, but think of what a thousand or more could do that think and feel the same, it's my opinion, and to be able to voice my opinion is just That, and for you to voice yours is just that, yours. It all sounds great on paper, but where are you going to find Customers to pay the considerably higher freight bills to accommodate all of the pay and perks your Company will offer its Drivers. It is simple supply and demand. Capitalism if you will. There are Many Companies that offer much of what you spell out in your post. They Only hire the" Best and Brightest, so to speak. All of those things you mention will never be available to the majority of Drivers. That would be Utopia. Utopia does not exist here on Earth. Never has, Never will. Communists have been promising Utopia to the masses for generations and generations now. We know the results! I totally agree with you Brett, as you can read by the few replies, it's a topic that only few dare venture into, but again, I would do anything I could do to help my brother truck drivers ..
the Driver is and always will be the heart and soul, and without him being told this and shown this, it's just an abuse of another man/ woman being prayed upon. The drivers are certainly the ones taking the most risk and making the most sacrifices to get freight moved around the country. No doubt about it. But at the same time there are an awful lot of drivers today working under conditions they're quite happy with. 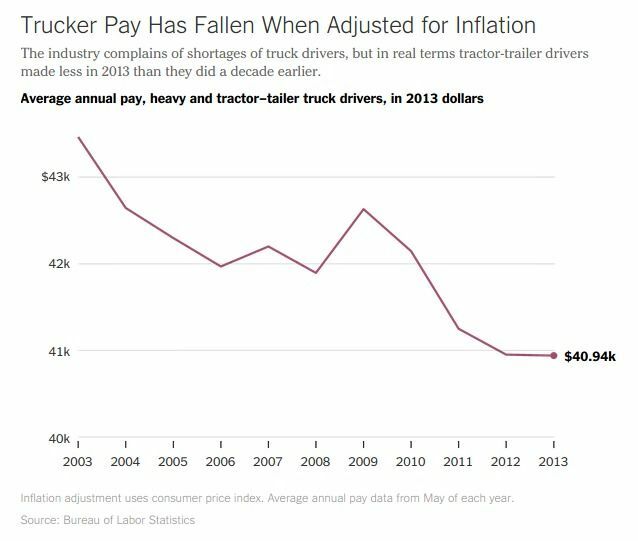 Most drivers that are working for successful carriers make very good money, especially for a blue collar job. Most are driving nearly new and very well maintained equipment. Most have solid benefits. Could things be better? Always. Could they be worse? Well they actually used to be quite a bit worse in a lot of ways. The trucks were far less comfortable and reliable. Many of the safety standards today either weren't enforced well or didn't exist at all years ago so drivers were running multiple logbooks and taking huge risks to make all the money they could. They were also forced into running illegal hours and unsafe equipment or they'd be sent packing. So wages have decreased relative to inflation but safety standards, driver protections, and even other areas within the industry like rest areas and truck stops have actually improved quite a bit over the years. So there's always room for improvement but it's gonna be a long, tough road. The profit margins are pretty slim in this industry so it's hard to really give drivers a sizeable wage increase and still remain profitable without making cutbacks elsewhere. Well, I this is a forum to share, and that's what I'm doing, just sharing my experiences and views, that's what Open Forum means, I'm not here to insure anyone, I'm simply stating facts, and I know there are SOME great Companies out there, it's just my opinion they are way to far few of them, and they can only hire so many? I would do anything that would benefit the driver, and I to would not want a mob scene or anything that would endanger a driver, I want to get the professional driver who is committed to this industry what he and his family deserve for the sacrifice we make each and every time we leave our family and go out and do a job that serves each and every person in this nation! And for all of you who don't take to heart of what we the professional truck driver do day in and day out,and take seriously, shame on you for not giving this industry what it deserves, 100 percent of safety, dedication and professionalism... You can hate all you want, bit you, will always be a part of the problem and not a part of the solution. Interestingly enough, most large corporations today were originally founded by some guy who thought he could do better than the current big players in the game were doing. Walmart was started out of disappointment for the way Kmart did things, Pappa Johns founded for the way Pizza Hut did things. So I'm all for people being disgruntled with the current situation to the point they're ready to take action. But creating a mob scene or going on strike isn't going to work in trucking. The industry is too fragmented. We need someone to start a company that pays their drivers so well and treats them so well that everyone will have to follow suit. Now we have to see who's ready to step up to the plate and go for it. Sounds to me like Rick is the man for the job! Well back then and up to 1992, my step father retired from ABF and retired comfortable, thank you ABF for thatt. I truly have looked into start up costs, and wow, I'm not saying I cannot get it done, but currently I don't have the means, but you can hold me to this, I will do it, and I am a man of my word, and that's how my company would operate, the Driver is and always will be the heart and soul, and without him being told this and shown this, it's just an abuse of another man/ woman being prayed upon. Actually, yes it can! In fact, it can happen quickly and you can control the entire thing. All you have to do is start a trucking company, hire drivers, and treat them to all of the things you just said they deserve! Once you're up and running you can be sure tons of awesome drivers would be thrilled to come work for you. 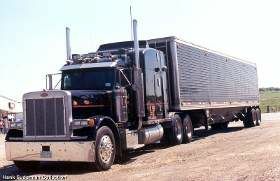 So call the bank, see if you can secure a loan for a few trucks, and let us know when you're ready to sign up drivers. I'm sure you'll get a huge pile of fantastic applicants to choose from. Man, this is gonna be great!!! You really have some awesome ideas and personally I can't wait to see if this sparks change in our industry. I would expect that once you set the shining example of how a company should be run the competition won't have a choice but to follow suit, right? Cuz I'm not working for anyone that's offering less than what you are, that's for sure. So get to it and let us know when you're ready for drivers! You're going to be massively successful if you treat your drivers this way.